The Rediwa C.A.T 3 visible clip system is a fastening system in view of the fact that it works by the support and holding exerted by the system clips on the ceramic borders. 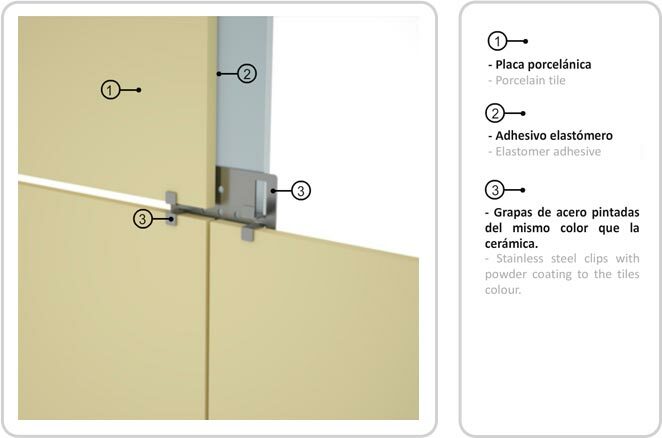 The fastening clips are made from stainless steel and they are lacquered in the same colour as that of the ceramic tile of the facade. These clips include a flexible material made from EPDM in the union between the back of the ceramic and the clip to make it easier to absorb expansions and avoid tensions and/or plate movements because of the wind. These clips are attached to the vertical structure using self-tapping screws. It allows ceramic pieces to be quickly and easily replaced. To make the system safer, the whole contact surface between the ceramic and the vertical profile (that coincide with the vertical joints) will be sealed with an adhesive MS chord. That is why the ceramic does not become detached if it is broken.